Industrial and its related sub-genres (or are they complexes or neuroses?) now has such a long history that there's limited scope for innovation. Industrial listeners even accept this to some extent, tolerating or welcoming the skilful repetition and re-deployment of industrial's corroding sonic archetypes. Yet it is not sufficient to simply repeat them ad nauseam. The sounds do not have to be "fresh", (a certain stagnancy is even one of the genre's tropes), but at this stage in industrial's evolution/de-generation veteran listeners need something more to fully engage them. 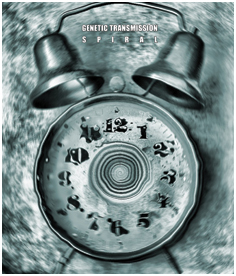 There are no really 'fresh' sounds on "Spiral" and some are quite clichéd. What adds interest is the format (a single long track) and some of the individual details and passages. It might have worked better as distinct tracks rather than a single body of sound. I "could" intervene and extract what I find most interesting (and some of it is very interesting) but a listener shouldn't have to do this. Greater selectivity on the part of the producer could have produced a stronger release. Although it's frustrating I admire the way in which the producer presents this as a formal exercise in listening and attempts to claim the listener's attention for the duration (if not always successfully). There's extensive use of found sound here and a sense of some obscure narrative unfolding in a way more typical of musique concrete than of industrial. Tomasz Twardawa uses a wide range of physical sound sources and these are heard both in their raw and processed forms. It begins with a desolate wind and is gradually filled out by various types of sonorous debris, some more identifiable than others. This opening passage actually reminds me of Pink Floyd's "Meddle", or of what I think I remember that sounded/felt like. Entering the soundscape proper you encounter a wealth of sonic detail that is really rewarding when it coheres and can be frustrating when it doesn't (though it's possible that the breaks in the flow are deliberate effects to frustrate or tantalize the listener but this is a risky strategy). The ways in which some of these sounds are allowed or forced to decay is really impressive at times. The mood veers between industrial/dark-ambient (dark chords, deep reverberations, and the (illusion?) of cavernous spaces) and, when the raw sounds become more prominent, electro-acoustic. These include tormented, slowed-down voices, bells, dogs and animal-like growling (by now an industrial cliché). It's in the last six minutes or so that all the elements cohere strongly, there's something here that I don't find in the rest of "Spiral". What sound like ghostly police sirens and other drones gradually build over few minutes then fade back again. So while the methodology, format and many of the sounds are interesting, "Spiral" as a whole is not consistently interesting enough, or at least not as much as some sections suggest it could have been.